So many firewood racks to choose from, which one is right for you? We understand that a lot of Americans have a need to store and dry firewood all year round so we thought it would be beneficial to show you some of the best firewood racks available today. But, beyond that, we spend the first section of this article educating you on what you need to know about firewood. If you just want to get straight to the firewood racks then skip the first 1/2 of the article. There are so many things in our life that we don’t give a second thought to. One of them is ‘Firewood’. Do you really know what firewood is? This is a question that is sure to elicit a puzzled expression from most people. Many people believe that the complicate their life by asking too many questions. Truth be told, knowledge is the key to true success whether it is in the home or in the office. Understanding every item that you buy or use, helps ensure that you choose wisely. While firewood may seem like a relatively insignificant topic to most, it is vital that we understand what firewood is and how choosing the right kind of firewood can impact our lives. Similar style to the Panacea 15209 (40″). Image from Larchmont Nurseries. For all logical purposes firewood is wood. If one was to define firewood further, one would say that firewood is the wood that we use to generate fire. While this definition is general and broad, there is another definition that gives us a wider perspective of what firewood truly is. It is said that firewood is any wooden material (yes not just chopped up logs) that is used as fuel. You will find that most of the time firewood is not processed. What does that mean? It means that the firewood will still bear some resemblance to the part of the tree that it came from. This kind of firewood refers to branches, twigs and logs that we toss into our fireplace to get a cozy flame going. Firewood can also come in less recognizable forms. Some of these forms include wood chips and wood pellets. These chips and pellets have been processed and hence they bear no resemblance to the tree that they have been harvested from. The knowledge that firewood isn’t just firewood may shock you! There is a lot about firewood that the average individual doesn’t know about. In fact, understanding firewood is a science in itself. The first thing that you need to understand about firewood is that firewood comes from trees. However, not all firewood comes from the same species of trees. This is rather obvious because the same species of trees do not grow all over the world. One cord of wood. This is what it looks like. You may wonder why this is important. It is important because each species/type of tress offers wood has different characteristics. Even the quality of the wood differs from species to species. The main things that help define if the species of trees is good for fire are the following points. As you can see, to truly understand how good the firewood is, you need to take into consideration multiple factors. There are a number of charts that are available on the internet which help you understand and compare different species of plants on the basis of the firewood they provide. All these contributing factors however can be linked to just two things: The green weight and the dry weight. One of the main key features that a person should look at is the green weight of the wood. You need to compare the green weight with the dry weight of the wood. Before we go any further let us first learn what these terms mean. The weight of a freshly cut piece of wood (before it is dried) is called the green weight of the wood. The weight of the wood after it is dried is called the dry weight of the wood. Since the green weight is checked when the wood is fresh from the tree, it contains considerably higher amounts of water when compared to that of dried wood. In some instances, the water content in green wood can be almost 50 percent higher than in dry wood. There are a number of reasons why green wood is not as effective as dry wood. Let us go through some of them. Wood produces heat when it is burnt. Since green wood contains a high water content, a large amount of this heat is then used to boil off the water. This happens even before the actual process of combustion can occur. This is why green wood produces less heat. Another thing that you should take into consideration is the amount of smoke that green wood gives off when it is burnt. You will find that green wood gives off considerably larger amounts of smoke when compared to dry wood. In fact, smoke isn’t the only thing that you will have to deal with. Green wood also gives off a lot of creosote. Creosote is the same material that deposits itself on the sides of chimneys. It is also the same substance that is responsible for chimney fires! The density of the wood is also important because it represents the wood’s dry weight per volume. This is because the denser the wood is, the more heat it is able to produce. It also makes the wood easier to handle. 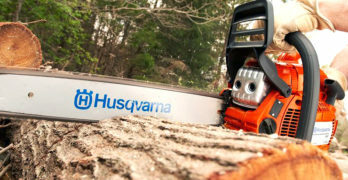 This compact log splitter will save you a lot of time splitting wood. A rough guideline can help you understand which would is better. It is said that hardwood trees and broad leaf trees have denser wood. Softwood trees and conifers however are less dense in comparison. Like we said before, a lot of the other factors are also indirectly related to the density of the wood. One example is the ease at which the wood can be split. While logic dictates that this means that it makes the process easier for you, it also helps improve the size of the wood pieces that are split. Once the wood is split, it is then dried. This means that the wood better will dry well and will inadvertently be better for burning. When the wood is burning in a fireplace you also need to take into account other factors like fragrance and the sparks that the wood can form when ignited. This is simply because any wood that sparks can give off embers. These embers can form a potential fire hazard. While this isn’t directly linked to the dry weight, it has been found that conifers produce more sparks than other kinds of wood. This is because conifers have higher resin contents than most other trees. Learn more about firewood on Wikipedia. 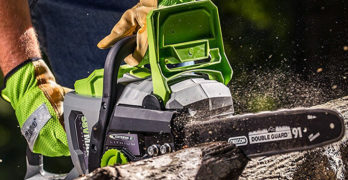 Splits firewood with less force than a standard axe. A safe and effective way to make kindling. Made of high-quality cast iron. Australian made. Bolt holes for permanent mounting. How do you know if the wood that you have is bad as firewood? There are a few symptoms that the wood displays that will help you quantify the quality of the wood that you are using. Let’s take a look at some of them. The firewood will not catch fire easily. Now this can get frustrating especially since you can’t avoid it. Firewood is meant to be used as fuel for your furnace. If it doesn’t ignite easily, then you are in for a lot of hassle till you finish your firewood stash. The problem doesn’t start with just the initial blaze. Bad firewood means that the fire will need continuous supervision as it may just flicker and die. Remember that bad firewood does not provide you with a constant source of flames and heat! The smoke that a fire lets out can be much more than you expect. This can lead to dirty glasses and a lot of air pollution in the house. Not something that you want to deal with on a regular basis! In addition to this, you will find that your house has a perpetual smell of burning wood. As explained before, bad firewood leads to a lot of creosote that can build up in your chimney. Since creosote is flammable, this accumulation can pose a big fire risk. Low heat output is something that people face when they choose the wrong kind of firewood. In fact, if people so much as find out about the dry weight of the wood before they buy it, they can save themselves a lot of grief! As you can see, all these symptoms just point out that you have wet wood in your fire place. Replace it with dry wood and your problem is solved! Seasoning wood is so much more than just drying the wood. It involves understanding how the wood should be seasoned and why it should be seasoned. People need to understand that the process of seasoning wood is an art in itself. Many commercial suppliers will levy all kinds of claims. Some say that their wood was cut the previous summer. Others claim that their wood has been extensively dried. What they don’t tell you is that the wood is usually cut in pieces and piled up. While the pile of wood may be placed in the sun, the wood however will not get well seasoned. This is because the entire collection of pieces of wood will not be exposed to the sun. On the contrary only the top layer will get the sun it needs. This is assuming that the top layer isn’t frequently replaced with a new top layer as the piling process continues. Wood that hasn’t been sunned will prevent your heater from functioning optimally. The same is true for wood that has been recently split. There is more to this story than meets the eye. Seasoning isn’t just about the quality of firewood that you use. It is also about preventing the spread of mould. Freshly cut wood that is not seasoned has the potential to catch mould. This mould then can spread to the rest of your house from whichever place you store the wood in. Proper seasoning, stacking and air drying of the wood can help prevent this. How Do You Season Firewood? There are four simple steps in seasoning firewood. Let’s look at each of these steps in detail. It will give us a better understanding of how they should be carried out and what is the importance of each step. The wood that you have should be of the right size and the right length. It doesn’t matter who does the cutting. You can get the prefabricated length from a commercial source or you can cut the wood yourself. The idea behind the right length is that the piece of wood should be able to fit in your stove. In other words, that means that you shouldn’t struggle to load your stove. The way to check this is to ensure that the logs that are cut three inches smaller than the actual length of your stove box. This ensures that the wood slides in easily. Bear in mind that you may also want to consider the breadth of the box. It all depends how you load the stove. If you use the length, then calculate using the length. If you use the breadth, then calculate using the breadth. There are reasons why normal firewood usually measures 16 inches. One reason is that usually cords or the actual branches are 48 inches in length and can be cut into three equal parts. Each part measures 16 inches. The second reason is based on practicality. It has been found that when any piece of wood that is bigger than 16 inches, it becomes more unwieldy to handle. So the 16 inch protocol helps ensure the ease of the user is preserved. It is also wise to note that real good quality wood is always uniform and does not differ much in length. The acceptable difference is nothing more than an inch! You may wonder what is the big difference between cutting wood and splitting the same wood. Cutting wood refers to the length of the wood. Splitting however refers to the cross section. Many of the pieces of firewood that are provided come in cross sections that are too large for use. It has been found that most wood stoves function well when they use firewood with a cross section of around 6 inches. Furnaces however can use slightly larger cross sections but even they struggle with thick chunks of wood. The reason why smaller pieces work better than larger pieces of firewood is related to their ignition point. Smaller pieces of wood have an almost instant ignition point whereas larger pieces take much longer to ignite. Another reason why smaller pieces are better than big pieces of firewood is because they are easier to dry. A lot of the moisture of the tree is held within the bark. That means by default, a log will hold its moisture within the bark too! This is why actual proper drying takes places only when the wood is split and exposed to the sun. The is why people who are experienced at wood burning will always start looking for their firewood almost six months before the time when they actually need it. Always remember to ask your supplier when the wood was cut and stacked. It gives you a good idea of how much work you have ahead of you. The best kind of firewood has less than 20 percent of moisture content when it is burnt. For the firewood to reach this state, it must be dried well. For homeowners the best and most practical way to do this is by using the wind and the sun. Now, if you are to use the powers of the wind and the sun optimally you need to understand a few things. The wood should be piled in a place where the sun can work its magic and warm it. The location should also be a place where you know the wind tunnels through. The combined effect of both these forces will help reduce the moisture in your firewood. Space however may be the issue that most of us face. Due to the scarcity of space many people may be tempted to pile two rows of firewood together. While this may not be optimal, you have to consider the constraints that are set before you. Your job here is to ensure that there is space between the rows so that the wind can blow through them. Also, ensure that the sun has access to both rows. This will aid in the drying process. Most people leave their stacked wood out for as long as six months. This is because six months is more than enough to reach your goal. You will notice that an experienced homeowner will start stacking his or her wood somewhere in spring. This is because she knows that her firewood will be ready in time for winter. The climatic conditions of where you live in will also affect the drying of the wood. This means that places with hot summers will potentially have better seasoned wood than those without. Don’t be disheartened if your summers aren’t very hot. All that it means is that you need to dry your wood for longer! Affordable and works great for checking firewood moisture. Never buy or burn water logged wood again. 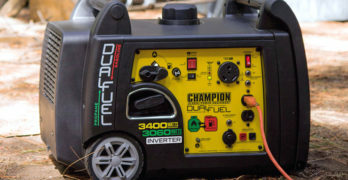 An affordable device that will help you determine when to burn your firewood. With the main process of seasoning done, the next issue that is faced by people is whether they should or should not cover their firewood. The theory behind covering the firewood is that the wood will dry faster. This is because it does not get wet in the rain. While using plastic sheets to cover your wood may sound like a real good idea, remember that every time the wind blows, you will fill yourself chasing those sheets. Another very good idea is to use a makeshift roof out of aluminum sheets. This will allow the wind to air the wood and will simultaneously protect the wood from rain. At the end of the day, the choice is yours. Covering the wood may protect it from the rain but if you don’t get much rain then why not leave the wood open? For most of us, stacking up the firewood signals the end of a six month long process. In fact, most of us are the happiest at this moment. This is because all the really hard work has been done and now the last part of the chore is surprisingly pleasant. Remember that while a neat stack of wood is pleasing to the eye, don’t hurry the process. Ensure that the wood is dry before you start stacking it up. Dry wood is the best wood! The way you stack your wood is absolutely critical. Wood that is just dumped in a pile will soon begin to draw moisture from the ground. Well stacked wood however will remain dry throughout the season. The process of stacking wood is a science in itself. It involves the use of certain ideas and concepts that are critical in ensuring that the quality of wood is maintained throughout. To ensure that the wood continues to dry, you need to ensure that the wind continues to run through it and air it. The best way to do this is to ensure that you orient the sticks in the direction that the wind is blowing. That way, the wind will funnel through the crevices. As we said before, the moisture from the earth tends to move upwards and into your dry pile of wood. This moisture eventually becomes the cause of rot. Some may know it better as bottom rot. This is particularly important if you are piling your wood out in the open. The best way to beat the rot is to ensure that the wood does not touch the ground. While most may say that this is easier said than done, the reverse is actually true. All that it requires is a good base. The base elevates the entire stock pile from the surface of the earth and voila! The rot has been prevented! The trick to a well stacked pile is to ensure that the horizontal boards are kept as level as possible. This helps ensure that the entire pile remains well balanced. How can you know just how well you’ve stacked your pile of wood? It is said that a well stacked pile of wood will not be disturbed by a child walking on it! Sometimes, two stacks of wood will join together and will form a gentle “V.” This design helps ensure that each fence supports the other. This helps ensure that your wood has some support and doesn’t come tumbling down. Some of the horizontal boards run on a one over two or two over one fashion. What does this mean? It simply means that the piece of wood fits in the groove that is formed by the two pieces of wood below it. This helps ensure that the whole pile is stable. Remember that wood piles cannot go very high without support. This is because they can easily collapse. The best way to increase the height of your wood pile is by using a fence or a wall to support it. This also helps ensure that the little place you have is used effectively. As said before, channeling air through the stack of wood is critical in ensuring that the wood remains dry. This can be done by using air channels. Air channels can be incorporated into the pile by using odd shaped pieces of wood. This helps create cross channels and the air will circulate freely. The shape and the size of the stack of wood do not matter. It is all up to you. Many people get creative and use different kinds of shapes. The way you stack your firewood is said to convey a lot about the person who did it. Neat and organized piles of wood are said to point towards a neat and organized person. Haphazard stacks of wood on the other hand depict an untidy and unruly personality. The shapes of firewood piles can range from circular to long fences. Each shape however needs to follow the above criteria for stacking. If the criteria has been met then you can be assured that your stacking technique is perfect. Stacking the firewood inside doesn’t follow different rules. You do however need to keep a few things in mind. The first and foremost rule is that you should never ever attempt to stack green wood or old water logged wood inside. The reason why is really simple. Today’s houses are well insulated. This means that the house does not allow heat to escape. It does not allow the cold to enter either. Heat and cold aren’t the only things that get trapped. Water vapor does too! Each cord can release up to half a ton of water. With all this water vapor trapped inside your house, you will soon begin to see signs of mould. Your wallpaper will soon get affected too! This is one expensive risk that you really don’t want to take. Another thing that you want to keep in mind is that some plant wood reeks. Examples of this would be cherry or fresh red oak. This smell will filter through your house and the smell can be potentially unbearable. Fresh wood also has beetles. Once the wood is stacked, you will find that the beetles begin to disperse. They begin to search for mates and may even lay more eggs. This problem can quickly get out of hand. Seasoned wood however does away with all these problems. That is why it is imperative to ensure that the wood is well seasoned. This is especially true when you store the wood inside. Firewood racks are designed to hold and store firewood. They can measure anything between 3 feet to 12 feet in length. These racks help you organize the wood neatly and also help prevent the wood from toppling and falling on you. They also help to stop the clutter in your space. Firewood racks have been known to provide certain advantages when compared to the usual methods used for stacking wood. Firewood racks help to organize the firewood. The firewood now isn’t an eyesore. In fact, the firewood now appears classy. The rack helps ensure that snakes, rodents and other pests are kept at bay. This is because haphazard stacking of wood leaves a lot of pockets. Rodents and other pests find these pockets extremely attractive. What Should You Look For When Choosing A Firewood Rack? There are so many types of firewood racks that are available in the market today. Choosing one can get very difficult. The best way to simplify the process is by finding out what are your requirements. One of the basic requirements that you need to look at is whether you need an indoor firewood rack or an outdoor firewood rack. The main difference between indoor and outdoor firewood racks is their strength. Outdoor firewood racks need to be stronger as they usually handle more wood when compared to indoor firewood racks. They are also exposed to the elements. This means that they need to be durable. Indoor firewood racks on the other hand are used for smaller quantities of wood. Since they are part of the house décor, the indoor firewood racks are more intricate and are designed to please the eye. The size of the rack is an important consideration. The size dictates how much wood can be stored. So invariably, the size of the rack will depend on how much wood you will need. While the size of outdoor racks is usually large, indoor racks tend to be much smaller. This is because of the space constraints that we face in our living rooms. An indoor rack should however be large enough to store sufficient amount of wood. By sufficient, it means that you don’t have to make frequent trips in the cold to restock it. What is The Firewood Rack Made Of? It is important to also pay due attention to what kind of material the rack is made up off. The material is a clear indication of how durable the rack will be. The common materials that are used are metal, wood and even acrylic. While choosing the material, take into consideration where the rack will be placed. Since outdoor racks need to be more durable, look at the metal racks. Indoor racks can be made up of lesser durable substances. Be forewarned that metal racks are more expensive than their other counterparts. No matter which rack you are looking at one of the first things that you will look at is its price. The price of the firewood rack is very often determined by the material is made up of. Racks which are made up of metals like steel are said to be more expensive than the other racks. Find out which rack meets your budget constraints and make your choice accordingly. When making your choice, make sure that you don’t compromise on quality. This does not mean that all cheap racks are bad. It just means that not all cheap racks will offer the kind of quality that you are looking for. There are various kinds of firewood racks that are available in the market. These racks come in a variety of different designs. Some of these designs can be broadly classified into categories. Let us look at two of the most popular categories available today. This is by far one of the most popular firewood racks available. The Classic firewood rack contains a long rack. The long rack has retainer walls on all of its sides. The way that this rack works is simple. The owner has to keep placing the wood in the rack. He/she arranges the wood until the holder is full. The holders of this rack depend on the width of the firewood rack. The range of the width can be anywhere between 3 feet and 9 feet. Most of the Classic firewood racks are made of metal and wood. The most popular metal used is steel. Since the materials are waterproofed, the durability of this product is extremely good. This ensures that the Classic firewood racks have an extremely long lifespan. The name itself suggests that this firewood rack is used to store large pieces of wood, otherwise known as logs. They are popularly used as indoor racks. It is designed to be placed near the fireplace and the sleek design gives an added decorative look. Log holders ensure that the firewood is kept nearby and is close at hand when required. It is practical and it is aesthetic. With all the knowledge that you have been equipped with, you can now understand the importance of using a firewood rack. Let us look at some of the most popular models that are available in the market today. A solid firewood rack to handle your storage needs. If you want a cover, make sure you buy the package that includes the cover as you’ll save quite a bit of money. Ideal for storing and drying firewood. Durable and designed to endure from season to season. Conveniently stores wood 9 1/2″ off of the ground, protecting it from insects, mud and water. Easy to assemble. Includes all hardware for assembly. Cover not included for the 82433 (8-foot) model. Landmann has used a simplistic design when designing its Landmann 82433 firewood rack. The easy to assemble product comes in two sizes (i.e. 4 feet and 8 feet). It is designed to be durable and hence is made up of strong tubular steel. This ensures that it can weather harsh climates as well as carry heavy loads. In fact, it even has a weatherproof powder coating. This helps protect the rack against rust. The beauty about this product is that it does not necessarily need to be an outdoor rack. Its simplistic design can fit well on your porch as well as in your living room! The two sizes help ensure that you can choose a rack that works best within your space constraints. Protect your firewood from insects. The Panacea 15203 deluxe firewood rack can be used as both an outdoor as well as an indoor rack. The rack is made of tubular steel comes with an additional rust resistance coating which makes it perfect for weathering the extreme climates outdoors. A nice size if you’re someone with a lot of firewood. Holds 1/5 cord of wood. Cover adjusts to fit split wood up to 24″ in length. Holds 2/5 cord of wood. Keeps firewood off of the ground, eliminating bugs, mold growth and wood rot. Easy assembly, all steel frame rack with black powder coat finish. Two-way adjustable polyester cover slides up and down to fit the height of the wood stack. The ShelterLogic Backyard storage series has been designed while keeping in mind that all firewood needs to be aired well. Like other firewood racks this rack too keeps the wood above the surface of the ground. The open structure also allows the air to channel through the stacked wood. What size do you truly need? The ShelterLogic backyard storage series comes in three different sizes (i.e. 4 feet, 8 feet and 12 feet). The 12 feet model stores a lot more wood when compared to the other models. 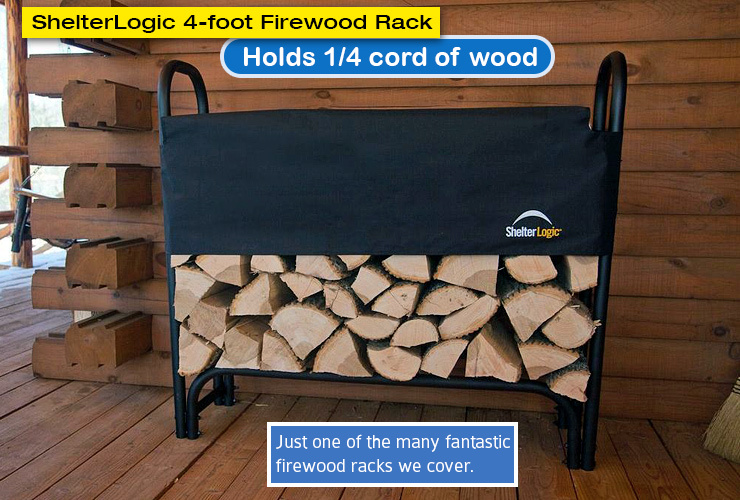 In fact ShelterLogic is one of the few good companies that provide the world with good 12 feet long firewood racks! Visit ShelterLogic to learn more. Available in 40-Inch and 20-Inch sizes. We have already seen one Panacea product that has taken the market by storm. The Panacea 15209 is another product that deserves your consideration. This firewood rack is made in the shape of a circular log hoop. The Panacea 15209 comes in two different sizes (i.e. 20 inches and 40 inches). While not overtly ornate, the Panacea 15209 has a certain alluring charm! It is made up of powder coated tubular steel. This ensures that the rack is strong and the rust is kept at bay. The Panacea is ideally suited for indoor use but since it is durable, this product can also be used in mild outdoor weather too. If you’re on a tight budget, this is perfect. Simple and effective. Durable, & affordable firewood rack up to 8 feet wide and 4 feet high. Assemble with one screwdriver (included). 2×4 Basics Firewood Racks can span up to 8 feet (2.4m). Depth is 16 inches. Kit makes a single level Firewood Rack; purchase a second kit to make a double decker unit. Hopkins provides a basic rack that is cheap and durable. They call it the Hopkins 90144 2×4 basics. The rack is strong and functional. It can easily store a lot of firewood and hence serves the purpose well. The wooden rack can be fully assembled with just a screwdriver. Once assembled, the rack will measure around eight feet in width and four feet in height. The depth is 16 inches, perfect for storing the wood. This particular model just provides a single level rack. If you buy more than one piece then you can easily stack them one on top of the other. This will transform the single row rack into a multiple row rack! Unique design allows you to adjust the size according to your needs. Holds and Stores up to 1/2 Cord of Firewood. Holds and Stores up to 1/4 Cord of Firewood. A good size for most homeowners. The last model that we will look at is the Pleasant hearth model. This firewood rack is made up of heavy tubular steel. The construction is coated with black finish powder. This gives the Pleasant hearth a really nice look. The Pleasant hearth comes in two fixed sizes (i.e. 4 feet and 8 feet) and one adjustable model which can be adapted to any size according to your needs. These Pleasant Hearth log racks require minimal assembly. The square assembly holes are designed to provide the firewood rack with extra stability. This is important especially when you consider how much weight the rack has to carry. The Pleasant Hearth 32mm Heavy Duty log rack has been designed for outdoor use only. Which Firewood Rack is Right For You? So, you see that every article in the world has a lot to teach you. Firewood is usually something that we take for granted. We use it daily during the winter. We may even grumble saying that the wood isn’t as good as the previous year. What we don’t realize is that we can determine how good the firewood is with some knowledge and a little work. The struggle to keep the firewood dry doesn’t end with just seasoning. The method of elevating the wood above the ground (when it is stored) is an important part of the puzzle that most people overlook. Choosing the right rack helps ensure that all the hard work you have put in does not go to waste. So choose wisely! Thank-you for reading our article on firewood racks. We hope you found it informative.